First drive for famous Steady Special – at ExCel this weekend! The famous ‘Steady Special’ Lancia Astura, originally designed by legendary writer and racer Ronald 'Steady' Barker, will be driven at the London Classic Car Show – the first time it's been driven in over 50 years. The historic 1934 Lancia Astura special has been restored and rebuilt to the unique design penned by the late Steady Barker, ex-VSCC president, Autocar road test editor and racing driver. 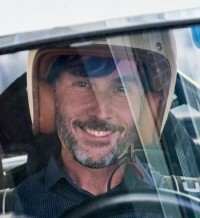 The restoration, which has finally made Barker’s dream a reality, was overseen by Michael 'Scottie' Scott (above), Steady’s long-time friend, founder of the 96 Club and of TIGOSE (The International Guild of Specialist Engineers) – and the current owner of the Lancia. The Astura started out as a six-seater limousine before it was bought over 60 years ago for £75 by Barker, who shortened its chassis and replaced the body with a lighter sportscar shell complete with an Aston Martin DB2 bonnet. It soon became known as the ‘Short Arsed Tourer’, and Steady competed in it in VSCC race meetings, setting lap records at Silverstone, Oulton Park and Prescott in the early 1950s. Barker later sold the Steady Special to Michael Scott in 1958 for £400 so that he could buy ‘the real thing’, an ex-Mille Miglia Lancia. Scottie painted it ‘Italian red’, fitted it with a hood and promptly drove it down to the South of France on holiday. Back home, he entered the car in a VSCC race at Silverstone but it was rejected, deemed ineligible due to its non-period Aston Martin bonnet, which Steady had got away with while VSCC president. The Steady Special was fired up for the last time in 1976 before being sold on to a fellow Lancia Club member who removed the body but did little else to the car before putting it back on sale in the mid-1980s. In 1990, Steady bought the engine and rolling chassis. It was during this second period of ownership that Steady designed, ‘on the back of a fag packet’, a body that he thought would be acceptable to the VSCC for the Post-Vintage Thoroughbred Tourer class. However, it wasn't until 2011 that work on this iteration of the Lancia began, with the fabrication of an all-new aluminium body to Barker’s design. Steady passed away in 2015 at the age of 94. Meanwhile, after a couple of false starts on the restoration, Scottie enlisted the skills of renowned 8C Alfa Romeo restorers Paul Grist and Terry Butler of Traction-Seabert to complete the work. 'Here we had a car that was crying out to be restored,' says Scottie, 'but also the legacy of sketches drawn by Steady some 60 years ago, illustrating how he imagined the Lancia should look. The Steady Special, now in period indigo paintwork, will lead 100 specials forming the centrepiece on the Grand Avenue of the 2018 London Classic Car Show at ExCel London from February 15-18.